What Is a Heated Blanket? A heated blanket is an advanced bed cover that has a heating element to regulate temperature. It is made of heavy and rigid material. An internal wiring system offers heat and warmth through different coil wires. Generally, the blanket is plugged in an electrical outlet to set different heat levels. Most blankets are made of acrylic and polyester to prevent fire hazards while they are interwoven to provide sufficient warmth. Heated blanket has three primary components, a heating element, which is an insulated wire, a special woven cloth, a power cord, and a bedside control. The wiring controls the room temperature. It is sensitive to heat hence eliminating the need for a thermostat. An insulator which comprises a distinct plastic material encloses the wiring. The power cord and bedside control are made of metal and plastic materials supplied by different vendors and manufacturers. Interestingly, modern heating blankets are computerized. They pre-warm your bed at a particular time after which they shut off automatically. Also, they are able to regulate temperature in order to meet your heat needs when you share a bed with someone else. Furthermore, some blankets provide varying heat levels for different body parts. For example, it can send less heat to your head and more heat to your feet when it is chilly. Recent statistics reveal that more than 4.5 million heated blankets are sold in America each year. The most popular brands have several heat levels, high, low and medium with each side of the bed covering having adjustable heat controls. 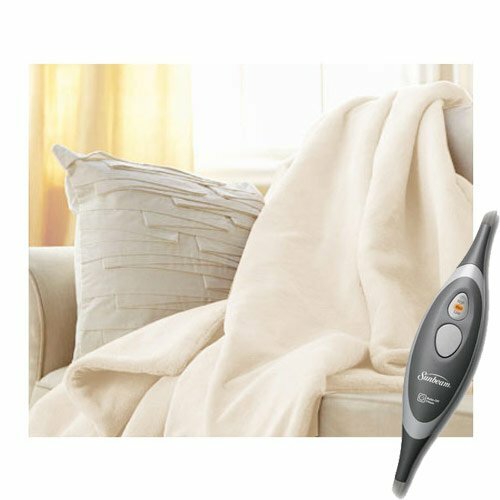 You can use a remote to control the heat level of your blanket. Alternatively, you could press a button to adjust it. How Does A Heated Blanket Work? A standard heated blanket constitutes several woven coil wires with a plastic coating. It provides constant heat once you plug it into a power outlet. On average, the blanket consumes 120V of energy. The wires achieve the desired temperature and you can use them before or while sleeping. Some clients prefer heating their beds with electric linen while others opt to switch it on while sleeping. Each electric linen has huge connectors at the edge of the heated blanket to transfer electricity from the outlet to the interconnected wires in the blanket. It is critical to disengage and physically unplug the connectors from your blanket before you clean or wash it. Place the connector at the bottom of the heated blanket or near the edge of your bed. It prevents the blanket from disconnecting in the middle of the night. It could overheat when you plug and unplug your connectors or when you move while asleep thus interrupting your power source. Latest heated blankets have sophisticated temperature gauges and thermostats which read the electric heat and body heat to offer a wonderful sleeping experience. Such models are automated to prevent fire outbreaks due to overheating. The mechanisms automatically switch off your blanket when it exceeds the desired temperature. You can reset it to turn on and off at a specific time thereby ensuring your safety. Moreover, such blankets are heated by carbon-fiber wires that maintain steady temperatures. They are widely used in manufacturing vehicles especially in constructing heated seats. An under-blanket is electric linen that you place on your mattress but beneath the bottom sheet. It is generally thin to perfectly fit into your mattress. However, it provides sufficient heat at night. The blanket resembles an electric mattress pad. The duvet is the most renowned heated electric blanket. It is suitable for use during spring and summer. There are different colors and designs which provide the comfort, warmth, and thickness of a steady heat source. A throw is an electric linen which is specially designed as a thin throw or ordinary decorative accessories that you could apply to highlight your furniture. It has an advanced wiring system that warms up your bedroom during winter. Many people wear thick clothes when the cold season sets in. Some of them rush to purchase a heated blanket. You can buy a nice heated blanket online from a grocery or house-furnishing store. Choose a model that matches with your décor and house design. The blankets are available in different colors, materials, shapes, and sizes. A typical blanket is affordable for many people. However, it depends on its thickness and quality. Most blankets have a battery or a single plug-in operated switch that automatically turns on and off. Also, they may come with adjustable temperature settings. Some people add an extra heated blanket into their current bed setup. Place the blanket between the bed cover and the sheet. Also, you can place it above the pre-existing blanket. Try out different setup options to maintain the desired temperature. Remember to check the safety warnings of the blanket while shopping. At times, you might not want to place the heated blanket on your bed. Instead, you can put it on a chair and watch movies to pass time. Ensure that there is a functional plugin nearby and that the blanket does not get stuck in any moving part. Read the safety precautions of your heated blanket once it is ready for use. They are normally inside the package to ensure that you use and maintain the blanket well to prevent accidents. You can layer the blanket to control temperature. If you want to use the blanket only, adjust its settings to achieve the right temperature at night. It has a tiny knob to change the heat levels. Some heated blankets have limited heating. They automatically turn off after the set time elapses. It is a vital safety feature which enables them to prevent you from leaving them on for long. At times, you could forget switching them on. The blanket provides sufficient heat throughout the night. However, it is essential to read the safety features of your heated blanket to confirm whether it has an automated shut off system. Nevertheless, it is advisable not to leave the blanket on when you leave the room for a few minutes. You might forget that you left it plugged. Generally, heated blankets switch off after 16 hours. Read the manufacturer’s instructions to clearly understand its automated mechanism. A typical blanket has several heating levels that are easy to adjust. The temperatures vary from a high setting, medium setting, and low setting. If you want to layer, it is necessary to activate the low temperature setting to control the temperature at night. It prevents you from experiencing insomnia. You will have a clear understanding of the setting you often use at night once you are able to adjust different heating settings. You might prefer having a medium setting. On the other hand, some people opt to activate the low heat setting. If you are sharing the bed with another person, it is advised to use your own heated blanket. Some blankets operate at different temperatures. Weigh out different heating options before choosing a particular blanket. Heated blankets play different roles. They keep you warm at night and minimize your energy consumption rate thereby lowering your utility bills. There is a high likelihood of having adequate heat throughout your home provided you have a heated blanket. Besides, you just heat one room and the read will spread evenly to other rooms. Furthermore, some blankets have a warranty in case they get damaged. A heated blanket is recommended for someone who freezes quickly during autumn or winter including arthritic people and the elderly. Their heating elements comfort them as they prevent them from freezing. They alleviate joint pain due to cold temperatures. Also, when you get accustomed to your blanket, it is usually possible to wake up early in the morning due to their cozy nature. Many heated blankets are safe to wash. You can also put your blanket in a dryer. Typically, the plug-in section of the heated blanket has a detachable extension cord.it helps you to wash and dry the blanket properly. However, although you can wash most of the blankets, it is vital to read the drying guidelines since it is prudent to lay out some blankets to dry completely. Mostly, it depends on your brand and the make of the blanket. Ensure that you understand the maintenance guidelines of your blanket to reap numerous benefits. Most blankets have a long lifespan and warranties in case they get spoilt. Like other devices, the blankets have certain instructions to follow when using them. For example, if you have an electric blanket, consider preheating it first. An ordinary blanket takes several minutes to heat up once you plug it in and switch it on. You can enjoy curling up on your couch s you watch a movie. It is recommended to set up the heated blanket beforehand for it to heat properly when you use it. Store the blanket properly after using it. First, unplug it and let it cool for some time before you fold it. Ensure that you store it in a safe place where its wires will not get pinched to prevent a fire outbreak and extensive property damage in your home. It is difficult to detect any damage in the wiring of the blanket fabric. Contemplate on where and when you will use the heated blanket. If you intend to use it in your bedroom, choose a blanket that perfectly fits your bed. If you will curl beneath it on your couch, you could pick a heated throw blanket. You can find travel-size blankets in different stores for long vacations and trips. The size of your blanket is a crucial factor that influences your experience when using it. You can easily dry wash a new heated blanket. However, you cannot dry it completely using a dryer. Unplug it and clean it thoroughly as you follow the user guide. Check its connectors, wires and electrical cords regularly to extend its lifespan. Traditional blankets were made of a scratchy and thin cloth. Modern heated blankets comprise fur, Sherpa, and micro plush and they offer a pleasant experience. The materials add additional warmth when the weather is chilly. Pick a blanket that comes with material suits your needs and matches with your décor. Subtle things can have a huge impact on the efficiency of a heated blanket. For example, if your partner does not sleep for long, choose a blanket that has a digital dial which produces little noise compared to the analog brands. Huge blankets often have two distinct controls which are appropriate for people who require different temperature levels. There are several features in the best heated electric blanket. It has a connector at the corner or in the middle of its bottom edge. Pay close attention to its position and cord length based on the outlet location. The blankets have numerous benefits besides warming you. They could alleviate joint and muscle pain commonly associated with certain health conditions. 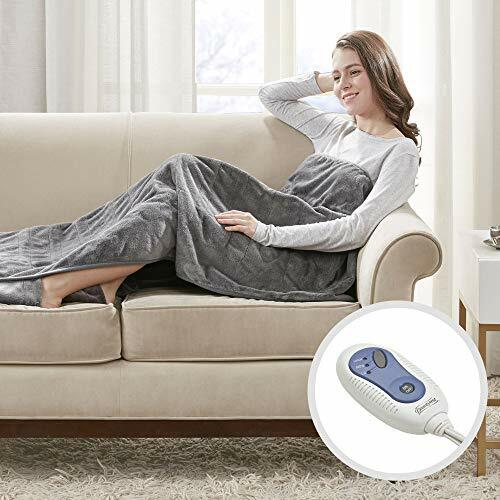 If an electric heated blanket has a timer device, it allows you to apply different heat levels to aching or itchy body parts for a particular period. They also cool you down during summer. It is wise to select a blanket with several temperature settings to control heat. Most brands have up to five settings. You could get a heated blanket with 20-heat settings. At first, it might seem excessive but it offers a wide array of benefits. Underwriters Laboratories is a safety testing entity that provides its seal of approval, the UL Certification. It shows that the organization has tested and approved the blanket. However, some companies do not advertise their UL Certification publicly. Many brands are UL certified and are safe for use. 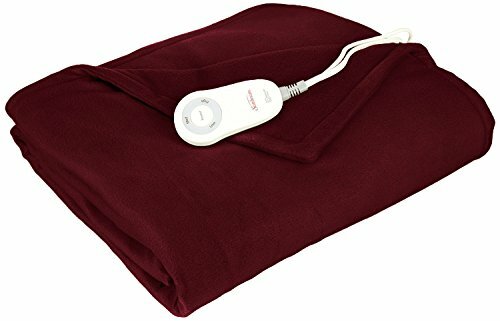 An electric heating blanket is known to induce sleep. Purchase one that has a timer feature to shut off automatically to avoid injuries and overheating. Most firms display certain features and benefits to consider when buying the blanket. It is wise to get genuine and unbiased information from customer reviews. Safety is a major consideration for many customers when shopping for heated blankets. You might have heard of a grisly accident that an electric blanket may cause. Normally, accidents result from improper use of the blanket. They have particular safety standards including a mark which shows that the product has met basic safety standards. For instance, the blanket should have a UL Certification mark. Different products have varying quality standards. Although people have different perceptions of the quality of heated blankets, their durability should be constant. The type of fabric used to make the blanket has a significant influence on its durability. Also, it should meet the comfort needs of its users. After some time, the heated blankets might start pilling hence forming small hard balls which prick your skin. The internal wiring could get damaged by several factors such as frequent power outages or voltage fluctuations. The blanket might have thin fabric layers which are uncomfortable as they fail to cushion the wires properly. Select a blanket that adequately prevents you from being in contact with its wires. Check if it meets the safety requirements of your country. Globally, there are two major types of bed coverings, a blanket, and a mattress pad. It is vital to know how each product functions. Typically, a mattress pad is placed on your mattress which is then covered with a sheet. The heat emanates from the bed to keep you warm. The pad has a strong warming effect compared to a blanket. A heated blanket offers heat at the top, most of which is lost in the room. It helps in maintaining the right heat level. A mattress pad is less prone to accidents, unlike a blanket. The blanket evenly spreads the heat in your bed. Most heated blankets have easy to use heat pads. Some have knobs while other blankets have buttons to set the desired temperature. Consider the use of use of the controls when shopping especially if you have a long-term health condition. Also, ensure that they have a clear and large display to locate the blanket at night. If you have savings and really want considering having the best heated blanket that is comfortable, cozy, machine washable, and lastly, with at least a year warranty, we have compiled a list of six top heated blankets 2019. Read on for details. 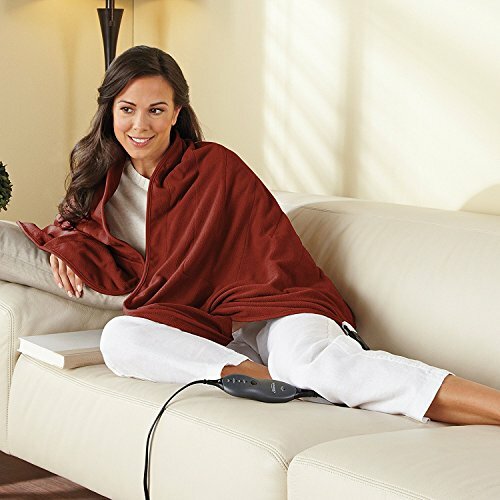 Holmes Luxury is a soft blanket with customized heat settings for a comfortable experience. Its ThermoFine system controls temperature and keeps it steady at night. It comprises several controls including the king and queen dual controls and full and twin single controls. The blanket is energy efficient hence ideal for different home designs. It cuts down your annual utility bills by up to 10 percent. This blanket allows you to set the thermostat to a low heat level while sleeping. It has ten heating levels, a preheat setting and an automatic shut off system. The LCD display control enables you to choose an appropriate setting. It has a UL certification mark. Sunbeam Microplush Velvet is a cozy blanket that offers extra warmth and ultra-softness when you use it. It has three heat settings, a 3-hour shut off system, and a simple controller. The blanket is made of pure polyester and it has a 5-year limited warranty. Usually, Sunbeam has a 110V electrical system. However, if you reside in an area with a different system, you can apply a converter for the blanket to function. However, applying a converter nullifies the warranty of any Sunbeam microplush heated blanket. The blankets are tested and they have a UL certification. Read the safety guide to avoid causing an accident. Sunbeam Wrap is suitable for commercial and residential use especially when you are in a cool region. Its versatile size makes it perfect for use as a throw or a wrap. It has ultra-soft fabric and warming pockets. The blanket comprises soft polyester which wraps you hence providing comfort and warmth. It applies the ThermoFine technology which adjusts automatically to regulate heat. The temperature controller of this blanket has three heat settings to set an ideal temperature. Also, it has a 3-hour automatic shut off system. It comes with a two-year limited warranty and it is durable. Beautyrest offers comfort and warmth throughout the year. It has three heat settings which offer sufficient warmth at night. The blanket does not produce electromagnetic emissions. It has a two-hour turn off mechanism that enhances your safety. Beautyrest is machine washable as it comprises a soft and light fabric. It has a 5-year warranty card. The blanket has a foot pocket and you can curl under it while reading novels or watching movies. It has a UL certification. However, it is only compatible with the Canadian and American electricity systems since it requires up to 120 VAC. It is not safe for toddlers, pets, and people who are insensitive to extreme heat. Sunbeam Heated Throw is a soft blanket which comprises a micro plush fabric. It has a ThermoFine system which detects and adjusts the temperature to provide a comfortable experience. Its controller has a 3-hour auto turn off system, and three heat settings. It has a warranty that extends its performance and quality assurance. Sunbeam keeps you comfortable, cozy, and warm during winter as you curl on your couch. It allows you to turn down the thermostat by up to 15 degrees hence cutting down your energy bills. This model is ideal for use on a couch or on your bed. It induces a gentle slumber during chilly winter nights. Beautyrest Plush applies the Secure Comfort technology which regulates the heat of your blanket depending on the ambient temperature, overall temperature, and spot temperatures. It ensures a steady heat supply. The technology has insignificant EMF emissions hence making it safe for residential use. The blanket is large, unlike other brands. Beautyrest comprises a microlight fabric which creates a comfortable throw. It has a 2-hour shut off system, and three heat settings. Besides, it is machine washable. Some people mishandle electrical products thus causing fire outbreaks. Here are several safety concerns that are often associated with heated blankets. Fire hazards occur when you misuse or mishandle a heated blanket. Current flows through its wires to keep you warm. A fire outbreak can occur if you fray, pierce or short the circuit wires. Crimping cords and wires creates hot spots. Not only should you be keen on how you use the blanket but also on its storage. If you store it for long, check its condition first before you switch it on. Inspect the cord for wear and tear. If you see burn marks and crimps, it shows that the blanket could blow up after a while. You can replace it or hire an electrician to repair it. Most heated blankets operate well at room temperature. For example, if you sit close to a window at night, the heated blanket will detect the temperature difference and produce more heat. The blanket could melt its electrical elements hence causing a fire hazard. If the blanket has hot spots, it cannot spread heat evenly; therefore, some spots may be overheated. You could get severe burns if you get into contact with the overheated spots. Avoid using the blanket in extremely hot or cold areas. You might be unable to properly adjust the temperature controls. Also, do not leave the blanket plugged in overnight. Turn it off when you leave the room or when it is not in use. Many people struggle to store their heated blankets properly due to their intricate design. You could damage its circuit wires if you try to fold it when it is switched off. Also, if you fold it when it is on for several hours, it can overheat. Moreover, rolling up the blanket could create a kink. Take caution when storing the blanket due to its fragile wires to avoid fire hazards. First, procure different raw materials from a certified fiber manufacturer to make the blanket shell. Afterward, blend and spun the fiber into yarn. Weave the shell on a high-speed loom with an elegant design for high efficiency. Structure the shell into 30 extended hollow tubes. Line them from head to foot. Do not sew the tubes together; instead, weave them as a cloth. Weave the extended tubes into a double layer and the fabric between them as one layer. Activate the loom for the machine to weave your yarn into a completed shell. The blanket discharges heat when you plug it into a power source. The heating element is a unique wire that has a separate thermostat. Its alloy is transformed into rods. Clean and pull them with a good wire-drawing machine. Their plastic insulator is formed through extrusion. Once the wire is complete, the assembly plant receives it as big spools and they insert it inside a blanket shell. The equipment used to thread the heating device into a blanket shell is specially designed for all heated blankets. It applies an advanced technology that holds one end of your wire and inserts it into the shell. The tubes are interconnected and the wires form a zigzag pattern due to the woven nature of the shell. Old models had a heating element that was divided into tiny portions which a thermostat joins. A continuous wire heats most modern blankets. You need to follow several extra steps to complete making the blanket. If you intend to manufacture the heated blankets for commercial purposes, it is prudent to sew your label one corner. Trim the edges of your heated blanket. Outside vendors partially assemble and manufacture the power cord and bedside control. Take and fit them in your blanket individually. Inspect and test each blanket before folding and packing it. Each component in the blanket requires individual testing. The complete blanket is also tested rigorously. The manufacturer subjects the blanket shell to several tests such as checking for the right thickness and for foreign substances. Then, they test the heating element as they make it ensure that they thoroughly examine each wire before they deliver it to a blanket assembly firm. The manufacturer tests the blanket to ensure that it lacks foreign substances and short circuits. It ensures that power flows at an ideal rate. Renowned manufacturers of power cords and temperature controls subject them to other tests. They register them with Underwriters Laboratory, a testing agency that inspects electrical devices. They follow certain outlined testing procedures and customize the blankets to meet the specifications of the laboratory. Underwriters Laboratory ensures that each manufacturer adheres to its requirements by making impromptu visits. Generally, the quality control policies of most manufacturers are stricter compared to the Underwriters Laboratory (UL). The laboratory allows them to display its symbol as long as they comply with its guidelines. Manufacturers are keen on fire safety hence enclosing their heating elements in water and fireproof insulations. Once the firm fully assembles the heated blanket, it tests it in full rated electricity. An inspector checks it for constant temperature and numerous flaws. In 1990, tests for magnetic and electrical field generation were a major concern for many people. There are no known side effects for generating the fields. When inspecting assembly plants, quality control personnel focus on the ease of use, general liability and fire safety of all heated blankets. A heated blanket either lowers or increases the temperature inside your room. An ideal blanket combines several features necessary to keep you warm. 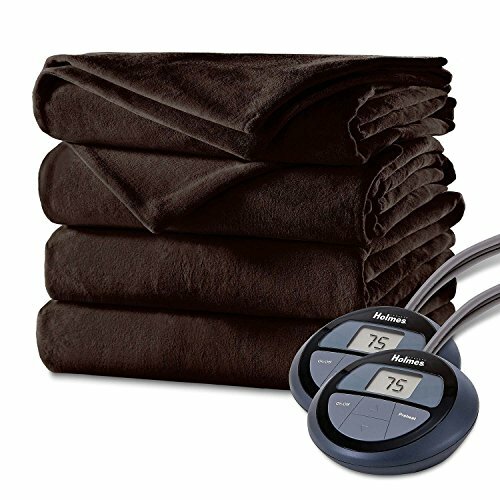 There are several vital factors to consider when choosing the best heated blanket including its warnings, dial style, size, features, and materials.